Visual memory is easier to summon up and colours are often the reason why a person attaches an association with a store, a product or a brand. Just as a logo creates a recall, attractive colours also perform a similar function. A retailer although, should be cautious when using bright shades like hot pink or red for his store. He can run a risk of making the store look flashy and too bright which can fail the purpose of attracting positive attention. A colour should be used in its correct tone to aptly convey the retailer’s message to the consumer. 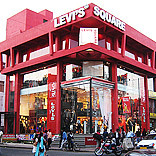 For example, Levi’s entirely red store and trial room also in the same shade remains forever embedded in a shopper’s mind because of the effect it creates. Colours create a stronger recall than catchy taglines, as they create an association with your product which makes it easier for the customer to remember and relate to. The purple and red of a Café Coffee Day outlet will be visible from quite a distance away even if the name is not visible to the eye. This association which a brand creates with a colour makes its visibility in an already crowded market area much stronger. The aim of a retailer is to showcase his products and capture the customer’s attention. Colours are an effective and powerful tool and help create an association with a product which the customer will remember for a long time. An aesthetic colour scheme always has a pleasing effect, and a retailer needs to be talented enough to creatively use colours for his store’s benefit.